When it comes to our younger visitors ‘learning through play’ is very much to the fore of KCM’s philosophy and, with that in mind, we run a range of seasonal events in and around the Museum. They happen through out the year and are specially designed for families and school groups. Those who participate get a unique, fun-filled experience of the Museum. Keep checking our Events section for updates or email us and we’ll let you know what’s coming up. Schools, please note that advance booking is essential for all these activities. 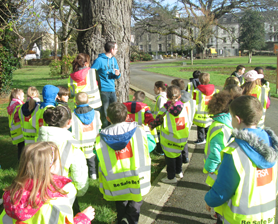 In the lead up to and during Tralee’s Tír na nÓg’s Easter festival, KCM creates a clue-driven activity trail in the Town Park. We will deck you out with a clipboard, treasure map, high-vis vest and all the clues you need to get started. From Bronze Age horns to Neil Armstrong – do you really know your Town Park? KCM’s Easter Town Park Trail is suitable for all children at primary school level and families of all ages. Are you brave enough to visit the Haunted Hall? Get ready for Halloween by encountering scary skeletons and human bones with hack and cut marks from deadly medieval weapons in our interactive Archaeology Hall. If you are not scared out of your wits yet, try our spooky ghost trail. Explore the streets and houses of medieval Tralee but be prepared to meet scary characters along the way. 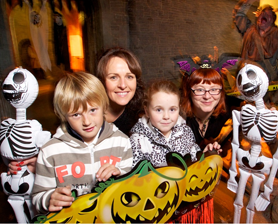 The Haunted Hall at KCM is an alltime Halloween favourite – will you be brave enough to do it? Suitable for all children at primary school level and families of all ages.